The Physical Therapist Assistant (PTA) is the only individual who assists the Physical Therapist in accordance with the American Physical Therapy Association’s policies and positions in the delivery of selected physical therapy interventions. Interventions include therapeutic exercise, myofascial release, massage, range of motion, facilitation techniques, coordination, balance, motor learning, assistive device training, brace and supportive device training, and application of physical agents such as electrical stimulation, ultrasound, heat, cold, and light based therapies. 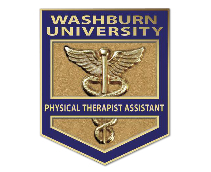 The Physical Therapist Assistant Program at Washburn University is accredited by the Commission on Accreditation in Physical Therapy Education (CAPTE), 1111 North Fairfax Street, Alexandria, Virginia 22314; telephone: 703-706-3245; email: accreditation@apta.org; website: http://www.capteonline.org. If needing to contact the program/institution directly, please call 785.670.2170 or e-mail mark.kohls@washburn.edu.